Kobenstyle cookware has been coveted by collectors and cooks since Dansk introduced the line of Jens Quistgaard designs in 1956. Recently revived for a new generation to enjoy, the Kobenstyle Buffet evokes all the warm mid-century charm of the originals. This enduring classic features distinctive three-point handles that are easy to hold and create a sculptural silhouette. The finishing touch? 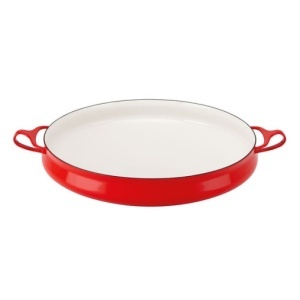 Three coats of glossy red enamel, for mixing and matching perfectly with vintage pieces or contemporary cookware.